Fluence added anaerobic digestion to the existing WWTP at an Italian dairy farm – without halting production. Fluence added a Continuous-Flow Stirred Tank Reactor (CSTR Digester) to the dairy’s wastewater treatment plant without stopping operations. Our highly innovative and technologically advanced waste-to-energy solutions provide great opportunities for dairy farms to maintain sustainable businesses. 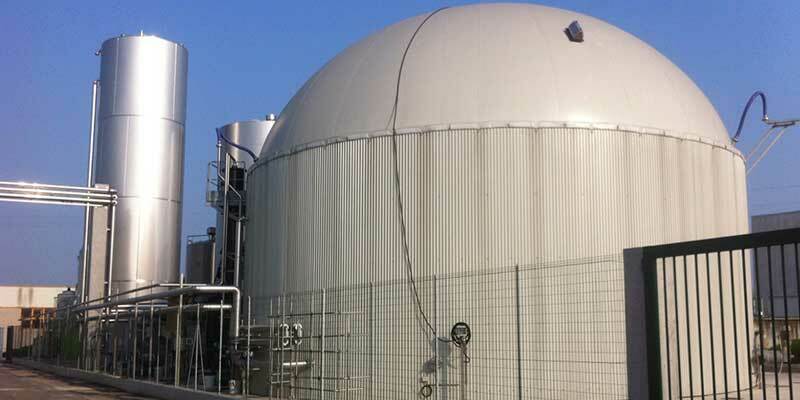 Because biogas plants use biodegradable wastes as feedstock for anaerobic digestion, companies can save money while meeting national and European waste-recycling regulations. This anaerobic digestion process produces not only biogas, but also liquid digestate, which consists of undigested material and dead microorganisms. Solid digestate is an excellent source of organic fertilizer and can be used in place of mineral fertilizers, reducing emissions of greenhouse gases. And, access to biogas creates new applications for dairy farms, such as small-scale power generation for processes and resale. Latteria e Caseificio Moro s.r.l., an award-winning dairy and cheese factory in the northeast of Italy, was established in 1978. In the mid 1990s, the factory was renovated to increase production. Today, the company produces milk and a wide variety of local cheeses, including ricotta, that are distributed widely throughout central and northern Italy. Moro products are used by a range of major Italian food producers. Scotta-whey is a byproduct of ricotta cheese manufacture. Although it initially was used as pig feed, a downturn in the market for pork and a reduction in the number of pig farms meant the dairy had to find another way of disposing of it. Even with a wastewater treatment plant, Moro lacked a cost-effective disposal method for the scotta-whey, a considerable problem due to high costs and strict environmental regulations. Fluence was called upon to provide a solution without interfering with the existing aerobic plant’s operation. With 30 years of experience in biogas production technologies to rely on, after successful pilot testing Fluence provided a solution to generate biogas with a high-yield index, while considering Moro’s economic and structural requirements. Fluence refurbished the existing WWTP to treat both dairy wastewater and scotta-whey without interrupting the existing plant’s operation. The scotta-whey first undergoes anaerobic fermentation. Once it has been digested, the exhausted scotta (the digestate) is separated into its solid and liquid components. The solid part of the digestate (with a solids concentration of 17-18%) is disposed of in agriculture. The liquid part is sent to the plant’s original aerobic treatment plant, which was upgraded to handle the higher nitrogen load. Anaerobic fermentation abates much of the organic carbon contained in the scotta-whey but leaves the nitrogen content unchanged. Biogas represents a great opportunity for energy-efficient growth and for the development of a sustainable economy. The anaerobic digestion process can be effectively applied to whey, buttermilk, and other dairy byproducts. Whey, in particular, can yield demineralized whey, powdered lactose, and other value-added products through the use of alternative technologies, including demineralization, ultrafiltration, or chromatographic separation. Fluence applies anaerobic digestion to whey byproducts in order to realize 100% of the dairy farm’s potential. Waste-to-energy technology can turn a liability into a money-saving asset. How can Fluence help improve your operation? Contact us to find out.